Buffers are a very important investment for rifle owners that want to protect their rifles from wear and tear. For a small price you can add many more years to specific parts of your rifle. This can lead to parts being worn down or broken. Thus with a buffer between the two contact surfaces, the buffer absorbs the impact, not the rifle. These buffers are made out of high-density urethane that holds up quite well to the punishment of the AK's recoil operation. They are ¼ of a inch in width, making these buffers special because they do not interfere with the recoil operation of the rifle. I received the second and third generation blackjack buffers in a unmarked manila envelope. Which is always a good thing because it keeps nosey mailmen from knowing you own some kind of firearm. The buffers were well packed in bubble wrap preventing the buffers from being damaged in the mail. Once removed from the bubble wrap the buffer comes in its own sealed baggy with instructions for installation. Luckily these things are so easy to install any Joe who can take the rifle apart can do it. It took my less then a minute to install. The first set I received was a series of 2nd Generation green colored buffers that were considered "medium" duty. A balance between durability and "shock" absorption between parts. These buffers are designed to protect from unnecessary wear caused by the extreme force of the recoiling parts in your rifle. I put over 2,500 rounds on them, 800 of which were bumped (mostly at the Calvert shoot)...they show little wear and definitely felt like they reduced vibration. Unlike most buffers, these did not cause any short cycling in my rifle. The next set of buffers I received were the generation 3 buffers, according to Randy these have been fully refined into two distinct types. A green version, which is the "medium" duty version and is the same as the black ones I have testing. And a black "extreme duty" version that is really hard. This black version sacrifices vibration reduction for reliability and protection. I have only put 400 rounds on this buffer but it looks like it will stand up to at least 5,000 rounds our more of full auto fire. With the Green and Black buffers the only ones being produced now you have to choices. As you can determine from the above information, the softer medium buffer absorbs more of the felt vibrations and noise from the recoil then the harder one. This is because the medium buffer absorbs more of the energy as a result from the recoil operation. So why would you want to go with a hard buffer over one that absorbs more energy? Well it is the lifetime of the buffer; since the medium buffer is softer it starts to deteriorate sooner then the harder one. Depending on how much, and how often you shoot, should influence your decision between a medium or hard buffer. For example if you are one of the lucky few who own a Class III AK, or one whom expends 500 rounds or more weekly in you AK, then the hard buffer would probably be a better choice because of the increased frequency of stress placed on the buffer. Not to mention the increased amount of ammo that can be cycled through in a day at the range, thus the lifetime of the buffer becomes a concern. Installation was a breeze and only took a few seconds. To install the buffer you need no tools, since they just basically slide on. First I lined up the buffer with the recoil spring. Next insert the recoil spring into the large hole on the buffer and slide it to the opposite end until it reaches the spring retainer. 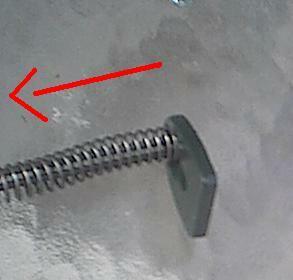 Then place the recoil spring back into the rifle and lock it back into place with the retainer. I followed the same formula with my past test. I put 120 rounds (4 30rd magazines) through each rifle with each buffer. I first tested the extreme duty buffer in my WASR-10. This buffer is a monster; I put 120 rounds on it and not a scratch. Basically it worked as advertised, it reduced felt recoil and vibration slightly while absorbing the force of the recoil to protect the parts. The extreme duty buffer in my SAR-2 was basically a repeat of the previous test, it reduced the felt recoil and vibration slightly while absorbing the force of the recoil. Again the buffer had not a scratch. Impressed with the results of the hard buffer I was eager to test the medium one. Installation was again a breeze and without a hitch. Again I planned to use 120 rounds per rifle. The WASR-10 went first again but this time I had installed the medium buffer, there was a noticeable difference between the extreme duty buffer in the amount of vibration and noise of the recoil operation. The medium buffer made a noticeable difference in how comfortable it was to shoot, there was a slightly reduced amount of the felt recoil also, but not near as much of a reduction as a good brake would provide. When I was finished with the WASR-10 I took the rifle apart and noticed the buffer had not a scratch on it. The SAR-2 was next and like with the WASR-10, the medium buffer reduced the vibration/noise felt to a slight muffled thud. The medium buffer does absorb more of the vibrations and noise produced by the rifle then the extreme duty buffer. With the SAR-2 the medium buffer makes the rifle a very nice rifle to shoot. The buffers do perform as advertised, protects the metal parts, and noticeably reduce the amount of the vibrations/noise felt from the recoil operation. I made multiple trips to shoots and ranges with these buffer and also got a chance to put a great deal of rounds on them threw bumping. Videos of which you can find in the bumping section. 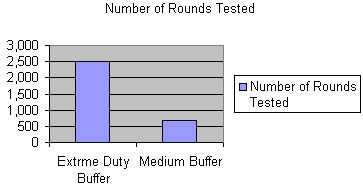 Below is a chart that shows how many rounds I have put on each buffer, I will update it every time I put more rounds on the buffers. Conclusion, these buffers are great for protecting you rifle and making your shooting experience a little bit more comfortable. Perhaps next time I will need to cycle through 5 or 6 cases of ammo before any one of these buffers gets a dent. If you want or need a buffer Blackjack does sell the buffers on his site, and even accepts credit cards now. Click the banner below for more information.